Windows on the World's introductory wine book by Kevin Zraly was the first one I read. The aroma wheel, designed by Ann Noble, was one of my first tools to learn the lingo and help me describe what I smelled in the glass. While unusual terms can certainly be used, it helps to have some common ground with fellow tasters as well. (The official website does not have a clear image of the wheel itself, but the internet does.) I liked that you could start on the outside and work your way in if you smelled something very specific or narrow down a broader sense of something by working from the center outward. However, many of the terms are confusing and some of the outside aromas don't seem to go together. Bacon and medicinal are not smells I associate with one another. It always seemed to me it could be done better and this one, from Aromaster is an improvement. They appear to make their money selling tasting kits and a board game but this is a useful version. I think the verbiage is clear and I like the section titled "FAULTS" a lot, although there should be some clarification offered. In table wine, sherry and madeira (and vinegar) aromas should be considered faults this placement might confuse people who are learning. Sherry and Madeira are not wines with faults, they are produced from controlled oxidation. The wheel featured above is a free download if you want a copy, click here. They also have highlighted versions of the wheel for a number of specific grapes but those are not available to download. 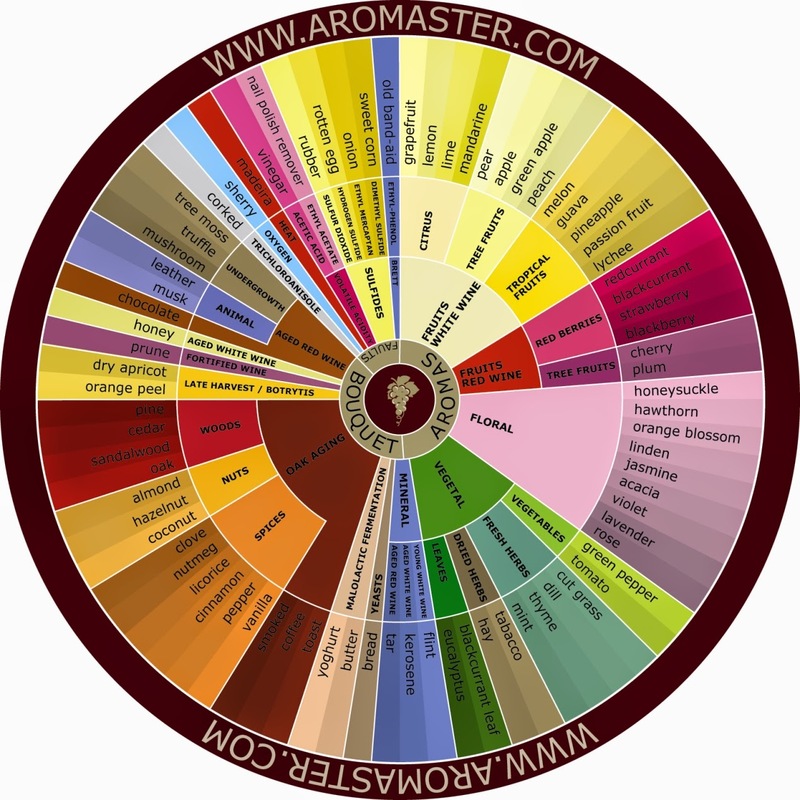 Of course, you are also welcome to dig through all of the images that appear on a Google search of "aroma wine wheels" if you want to find more aroma wheel choices. The aroma wheel doubles as a flavor wheel since taste and smell are so closely related. Mouthfeel wheels have also been designed to help explore texture and how the wine feels on your palate. Here is one in black and white and the same version, but in color, at the bottom of this scholarly pdf. Here's one more, that says it is specifically for white wine (Sorry, the link is terrible - you need to click then select products and then Wine Mouthfeel Wheel - they do have a beer defects and wine defects wheel as well). All of this searching was prompted by a Wine Spectator article that featured a Brettanomyces wheel. 'Brett,' as it is more commonly known, is a spoilage yeast that can ruin wines but, in a classic example of wine world confusion, can also make them more interesting - especially if you like more wild, barnyard aromas. You can read more about Brett in my Resources section (Tips to Avoid/Identify Bad Wine) or just click here. 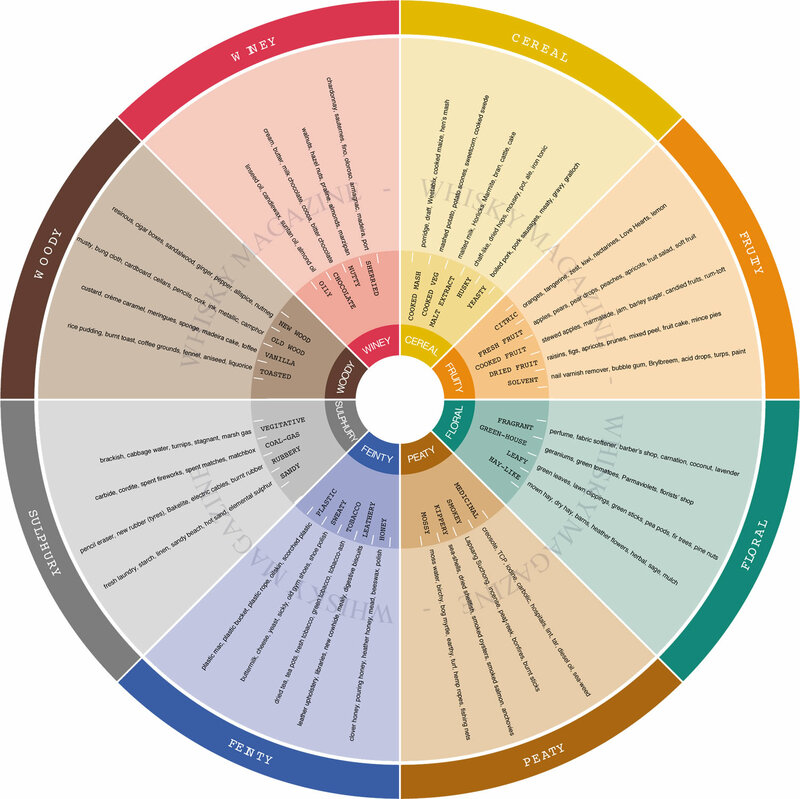 I also found an evaluation of a square version of the wine wheel, a beer wheel, a Bourbon wheel, a whisky wheel and even a sake wheel (you have to scroll around a bit but it's there). A lot of information to explore, I will post this in the Resources section for easy future access. Some big names have been involved in some high profile cases regarding fake wine lately: Bill Koch vs. Eric Greenberg, Rudy Kurniawan duped lots of people (including Bill Koch) and more recently, Julian LeCraw, Jr. filed suit against an auction company. So what, those guys are buying bottles worth tens of thousands of dollars that are decades, or even centuries old. What does that have to do with me? The lesson these collectors learned was that if something looks to good to be true, it usually is. Anyone can fall victim to scams, the Koch brothers are worth so much they can afford to stick their nose into everyone's business. A member of the Forbes family bought a bottle reported to be part of Thomas Jefferson's collection (read about that story in The Billionaire's Vinegar). Smart people, taken in by charlatans. Okay, okay, I get it..but what does this have to do with me? You and I are unlikely to be shopping for 100+ year old wine or bottles priced at five figures each but this is still relevant. Hucksters and weasels will always exist. You should be aware of them. Everyone loves a bargain but beware of closeouts and blowout sales. The wine business operates on lean margins, 15% to 30% is the norm. Larger markups are found but no one doubles or triples their cost like you sometimes see in clothing, for example. In department stores you see half off sales all the time, not so in wine stores. So, when you see deep, deep discounts be wary. Don't avoid entirely but be careful. The online market is full of wild prices, I have seen a New Zealand sauvignon blanc advertised as low as $8.99 and as high as $19.99. Be sure to check the vintage if you're shopping online, especially with white wines. A sauvignon blanc for $10 that you see in your market at $15+ may not turn out to be a good buy if the vintage is two or three behind the current release. And that's before considering the shipping and handling, which can easily go beyond three dollars a bottle, or any return shipping/restocking charges should you try, and be allowed to, send unsatisfactory product back. Also, if you buy remotely you can not monitor the storage temperature or the conditions during delivery. My experiences with shipping wine have been mixed. On most occasions the bottles have arrived in excellent condition but I had one experience involving bottles hot to the touch - I happened to be home when the delivery company brought them, in a non-air-conditioned truck. I, of course, refused the product. People shop for deals all the time, myself included, but there is a point where I am more than happy to pay an extra dollar or two in order to insure either correct handling or an easy, local place to return subpar merchandise. I am especially sensitive to the shipping concerns living in a city where sunny and 80 degrees is possible pretty much anytime and 90+ degrees is a guarantee for months at a time. When wine is exposed to heat, it takes very little time to damage it. Even locally it is wise to pay attention to the shop and how they care for their inventory. I was in the business a long time and I know some wholesalers load their trucks the night before and leave them outside overnight, even in the summer. Those same trucks leave for the day and are sometimes still delivering after 5pm. They are also rarely air-conditioned. Ever been in a truck helping a friend move in the summer? Then you know how fast those temperatures rise. For a few years a place I used to work bought distressed inventory, heat damaged, from some very big names in Burgundy. The wines would be offered at about 40-50% off of their usual retail price. People snatched them up faster than it seemed possible. We told as many people as we could that they should drink the wines soon because they would not age well, due to serious heat exposure, but I'm sure some cellared their bargain treasures too long. The wines were tasty in their youth but were unlikely to stay that way. The company also bought huge truckloads of closeouts from time to time, these shipments rarely included anything worth drinking at any price. The sales staff disagreed with offering these wines for sale but were told it was happening anyway. We did our best to discourage purchases when we could but people clung stubbornly to their "deal" over a similarly priced wine that was in great condition and tasted good. After Katrina, I heard rumors of wine being sold off in bulk to south of the border destinations despite having prolonged exposure to extreme temperatures. Who knows if any disclosures reached the end consumers for those bottles. Wineries sometimes have an off vintage where the wine simply is not as good as usual. They will sometimes dump that product into a market when the next vintage is ready to ship. You might find a relative bargain but will you like the wine? There is no guarantee of perfection in your glass but it is a step in the right direction. There is an old axiom in the business, "There is no good wine, only good bottles" - meaning even two bottles purchased from the same case and stored identically won't necessarily taste exactly the same. Increase your odds of finding good bottles by shopping locally with reputable merchants...you have heard me say this before and you will hear it again.